VATBox is demoing a first-of-its-kind, cloud-based, truly automated solution. The automated VAT recovery solution and dashboard enable customers to build one global process that tracks and manages VAT spend with ease. Automation guarantees reduce risk, simplicity, and ease of use by eliminating human error and reducing the inefficiencies of manual processes. But, automation and transparency isn’t only about the money, it’s about data integrity. Qualified and validated data delivers visibility, control, and compliance. VATBox empowers companies like Teva, PPG, and Broadcom by maximizing returns while enabling transparency. Deployment is simple; all it takes is a few simple steps. We’ll be in London three weeks from today, where drinks will be served, networking will be in full force, and we’ll be wrapping up the first day of FinovateEurope 2015 (get your ticket here). CoinJar is a digital finance platform that gives customers a way to manage and spend both traditional and digital currencies when and how they want. CoinJar provides end-to-end solutions to unlock Bitcoin’s potential. Rubyist. Student at University of Melbourne. Bitcoiner. EVRY is the Nordics’ leading financial service provider and is presenting Spendific, a concept designed to make personal finance simple. In Spendific there are no complicated graphs or charts to tell you whether you’re on track with your finances. Just one number. No worries. Moa has previously worked as a youth economist in a large Norwegian bank, with responsibility for the bank’s main channel of communication towards young people. Combining two decades of technology and marketing experience with an open mind, Meldal is passionate about bringing better financial services to consumers. FOBISS is a first modern tool enabling retail banks to manage their entire cash supply chains with one button click. The industry’s first and only cash management system empowered by Artificial Intelligence and driving best decisions on time. Leonavicius has more than 10 years of experience in management consulting. Led multiple businesses through start-up phases from establishment to breakeven. Ojeras is an IT Sales professional with more than 10 years of experience within multinational IT organizations. Strands designs and creates next-generation digital banking experiences to help individuals and SMEs manage their finances. Trunomi offers an innovative technology platform that streamlines Know Your Customer and mobile verification using a revolutionary consent-based data sharing platform. TruMobile securely connects customers with banks. Monetises and personalises your customer’s data experience. Streamlines verification KYC using a revolutionary consent-based data sharing platform. A customer-focused mobile solution that eliminates their most significant pain-points; making their account opening and data management experience simple, secure and easy. Lacey is an innovator, team-builder and thought leader. Sometimes mistaken for the Energizer Bunny – he is relentless in his drive to find better ways to learn, build, nurture and share great ideas. Brewin is a multi-tasking, Trunomian super-star. She attended University in the UK, helped run campaigns for major political parties then earned a black belt in the “Art of Customer Development”. VATBox is the first, cloud-based automated solution for Foreign/Domestic VAT recovery, providing data-driven visibility and insights while maximizing VAT returns. VATBox’s Automated VAT recovery solution enables customers to have one global process that tracks and manages VAT spend with ease, and to maximize VAT refunds. Coleclough is a Tax Consultant in Mishcon de Reya’s Tax Group with over 30 years’ experience in tax and law. He was formerly a Partner and Global Leader of Indirect Taxes at pwc. 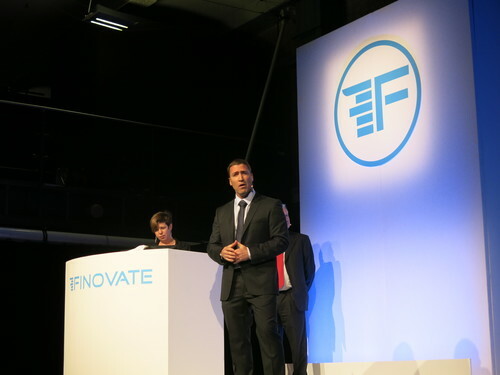 FinovateEurope will be held February 10 & 11 in London. Pick up your ticket today to save your seat at the hottest fintech event of the year. Questions? Check out our FAQ for some answers.